Pinewood’s Dynamic Presence at the TESOL Macedonia Thrace 25th Annual Conference. 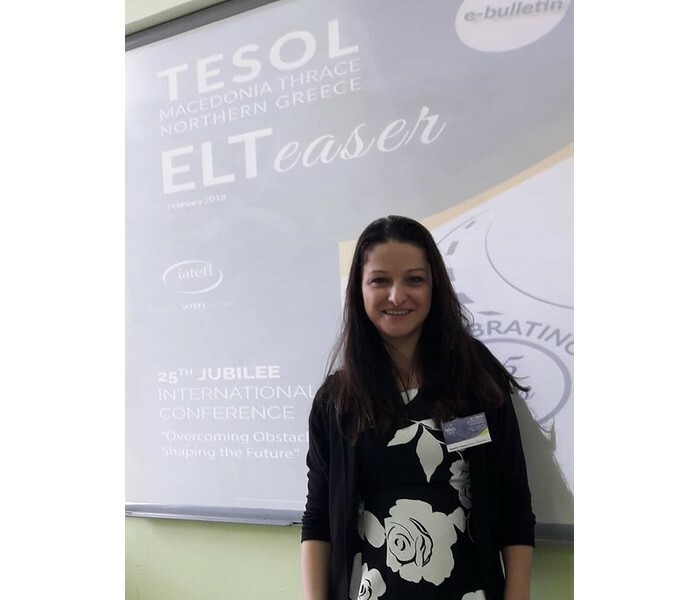 On February 23-25, 2018, Pinewood faculty, staff and students participated with great enthusiasm in the TESOL Macedonia Thrace 25th Annual International Conference, Thessaloniki. Conference organizers were very pleased with the ten student volunteers from Pinewood who worked as room monitors during the weekend: Eleni C., Valentina H., Oskar K., Dimitra K., Martina L., Bianka M., Elira R., Alexa T., Dimitris T., and Athanasios Y. This team of student volunteers were very effective at their jobs, helping the participants find the talks they wanted to hear, and making sure that speakers started and ended their presentations promptly. As part of the conference proceedings, three Pinewood faculty members gave professional presentations. In the first session on Saturday morning, Feb. 24, Ms. Helen Dalakas delivered a presentation entitled “Promoting Creativity in the Classroom,” in which she described and illustrated the important role of creativity in the language classroom. In the second morning session, Ms. Alexandra Valtzidou presented a talk entitled “English language learners with learning differences: Who are they?” In her talk, Ms. Valtzidou described the basic literacy skills of second language learners, and explained how their skill sets differ from those of students with special learning needs. In the final session, on Sunday afternoon, Ms. Zoi Tsviltidou presented a talk entitled “Building literacy with synthetic phonics using online tools for class.” Ms. Tsiviltidou explained the importance of phonics instruction in developmental literacy, and she demonstrated several online tools for teaching young children sound/symbol correspondences as a foundational skill in reading. Also representing the Pinewood faculty were Ms. Evie Kota and Dr. Linda Manney, who attended the conference as participants. On Sunday afternoon, at the end of the event, two Pinewood faculty were elected to the 2018-2020 TESOL Macedonia-Thrace Governing Board: Ms. Alexandra Valtzidou, elected as an alternate Board member, and Dr. Linda Manney, re-elected for a second term as a full Board member. All in all, the conference was a great success, in large part because of the quality of the professional presentations, as well as the important work done behind-the-scenes to keep the conference running smoothly. Throughout the weekend, Pinewood faculty, staff and student volunteers were an important part of this effort, and created a favorable impression of our school with both local and international conference participants.